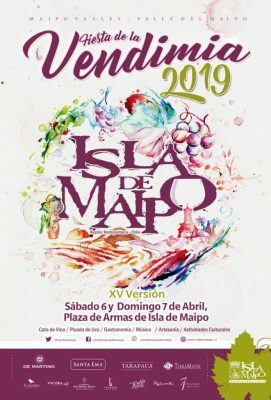 Next Saturday 6th and Sunday 7th April, Viña 7 Colores will be present at the 15th Harvest Festival of Isla de Maipo, where we will arrive with our best Reserves and Premium wines. We expect more than 20.000 people at the event, which will have activities as contest “My favorite Wine”, Saturday of Whites and Sundays of Reds, and more. In addition, food court with approximately 35 stands. It is on the main avenue, Plaza de Armas and its surroundings.